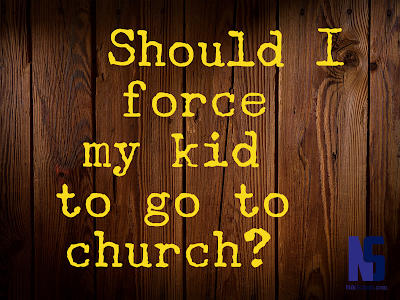 Nik Schatz: Should I force my kids to go to church? Should I force my kids to go to church? 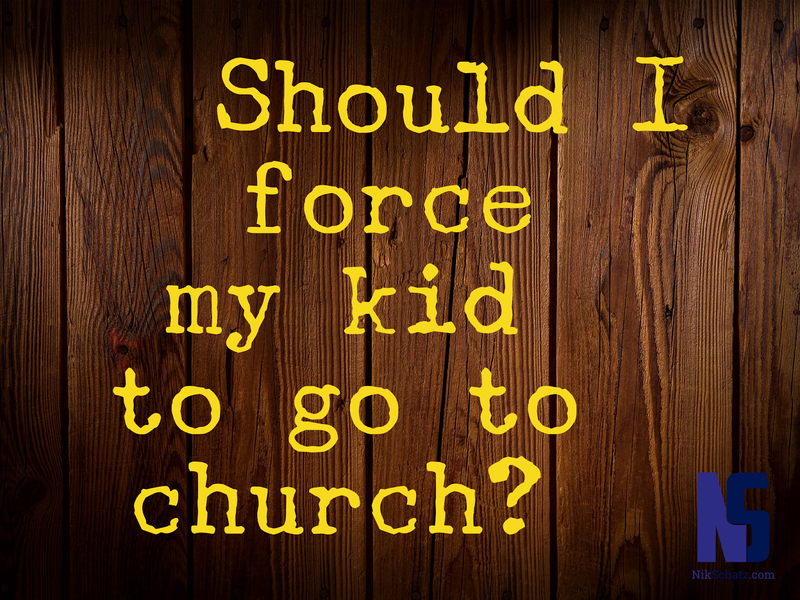 More and more, I’m hearing parents wrestle with this question: Should I force my kids to go to church with me? Every child or teenager is different, and I certainly cannot tell you what is right for your family. But here are some ideas to chew on as you try to make the right decision. Let’s weigh the options. If you force your kid to go to church, he may growing up hating it. You will be risking having a grown child who leaves the church, and the Christian faith, and never looks back. The rate of young adults leaving the church has been rising for years now; this is a legitimate fear. If you allow your son or daughter to stay home while you go to church, you will be honoring his independence and allowing him to think for himself. You’ll be giving him a chance to make an adult decision - and as kids grow, we want to give them greater independence so they can mature, right? I’ll share how I feel about all this, knowing that you are the God-ordained authority in your own kid’s life, and that you care deeply about his faith and future. So don’t take my words as “the gospel truth”, but heed them as a pastor who wants to equip godly parents. The “Hate Church” Problem: Forcing your kid to attend church may cause them to hate the church when they are older. However, letting them stay home won’t cause them to love the church. The best shot you have at helping your kid appreciate the Christian faith is taking them to a local church every weekend. The “False Dilemma” Problem: It may seem like you only have two options - make him attend church, or let him stay home. Not true. After you answer the “Why” question, see if there's another option. If your kid hates the youth group, you could simply allow him to attend the adult service/class instead. If your children’s ministry is lackluster, there may be another church nearby with a really good kid’s program. If it’s a problem with one of the children’s/youth leaders, you should talk with one of your pastors about that. *Focus on the Family has some good thoughts on this specific to teenagers in this article. **For more in Scripture about our responsibility as parents to lead our children to love God, see this earlier post.